The Safe Keepers Are on Their Way! Sometimes we hear urgent sirens breaking the peace. The sound breaks the peace, but it is for keeping us safe. If we call 119, the safe keepers, fire fighters, are on their way. They are in there when there are fire, car crash, drowning, or any other emergency, they are there. Even in the hot summer or cold winter, they are always in their positions. We often see remarkable scenes shown through the media. However, we do not know the details about a fire fighter. 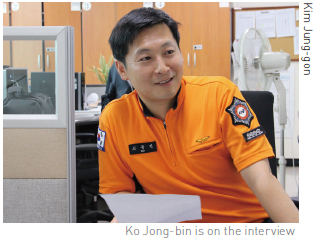 To introduce and give information to the University of Seoul (UOS) students, The UOS Times visited Dongdaemun Fire Station and met with firefighter Ko Jong-Bin, who works in the Public Relation Planning Team. Fortunately, the station was not busy on the day we visited. Thanks for accepting the interview, please tell us about the routine of a firefighter. Could you introduce your daily works? Usually all public officials follow the manual, and work rotationally. We are not in the same position our whole career. Some officials work five days a week like me and others work at the scene. We rotate every two years on average. We call a person who works at the scene a field rep so as an example of a field reps day. At 8:30 a.m., they change seats with the night shift. They transfer duties after coming to the office, start their official work at 9 a.m.. After starting my duties, I usually check equipment, train to work proficiently at the scene, work administration service, and move to scenes in between these tasks. And then change with the night shift at 5:30 p.m.. We usually work in this pattern. Please explain what equipment you use for your work, like firefighting equipment. There is equipment for private and for common use. Turnout gear, a helmet, rubbers, air respirator, an oxygen tank, a mask, and gloves, these are our private pieces of equipment. There are other various kinds of equipment; like for lifesaving, traffic accidents, rescuing someone drowning, and emergency things if it is classified by our work correlation. We transfer people with injuries to hospital like an ambulance. Also, we need a hammer or hydraulics when picking off big icicles or getting a stuck kid out of somewhere. We have first aid kit for emergency, a hose for fire fighting, and we have protective clothing and a spray to drive away wasps. It is a kind of a simple question. How do you take care the stress from the work? I usually just hold it, most of the field reps do their hobbies. It will be good to take care of stress through hobbies. Do you have any unforgettable scenes throughout your work experience? I do not have a lot of experience at the scene but there was a motorcycle accident when I was a beginner of firefighters. A bus crashed over the motorcycle driver. It was really terrible. The driver was concious, though he lost one of his legs. I had not seen such a scene before, and I thought the seniors were really awesome. They picked up and gathered all pieces of muscle, flesh, and bones of the broken leg. And then, they washed the pieces in saline solution, gave first aid to the driver, and transported him to a hospital. That was amazing I think. After the work, I told them what I felt and they told me it always happens. Actually you explained already at the earlier question about equipment, but tell me, is there any other work except fire fighting? Of course we have other works except for firefighting; like me, public relations. There is also preventive work, which is the most important work. The name of that department is the Fire Prevention Team. It is to take action before getting trouble. We are also in charge of a fire protection system. To give an easy example, can you see the fire extinguisher in the corner of this room? And there is a sprinkler on the ceiling. We can give a legal restriction to buildings, which is quite important. Many students prepare to be firefighters, please tell the hardest thing to you during preparing for this job. The hard one was studying. Studying was the hardest. I studied at a library near my house, then later, I studied in Noryangjin. It is famous for studying. Competition for this job was really strong. That was one thing that was hard. It is the last question, do you want to tell something or could you give a word to students who prepare and want to be the fire fighter? I want to tell some serious thing. 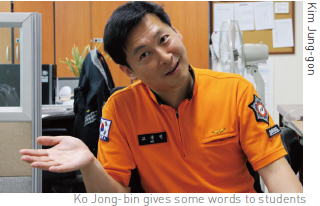 Image of public officials could be different with a better external image. When I surf the internet, I have seen black humor about public officials. Like about they are idle because they get a stable salary. However, the job is for the public so a mind for the public is very important. This job is different to enterprises in that it is not for creating profits. Therefore, your mindset is essential that you have to think deeply again before getting this job. Through this interview, The UOS Times found out that life of fire fighters is busier than people think. Their work range is so wide from little accidents at playgrounds for kids to terrible accidents almost like a disaster. Did anyone know they even have a wasps spray? The interview was not that long but he answered kindly and in as much detail as he could. When he talked about studying being the hardest one that made me laughed as a student. He emphasized the mind of the public officer for the students. It showed what he thinks about his job. The office was calm and quiet, in contrast the fire fighters' eyes were so serious and sparkling. 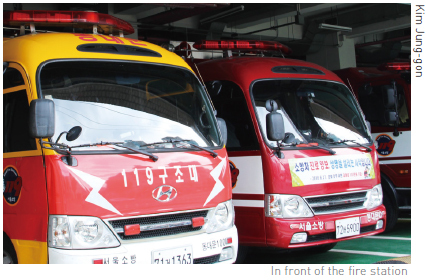 Thanks to them, the city of Seoul will be safer.